Medical Physics is the application of physics to healthcare; using physics for patient imaging, measurement and treatment. Medical physicists are graduate scientists, normally holding post-graduate qualifications, who work in many different areas of healthcare managing and delivering services and carrying out research and development. 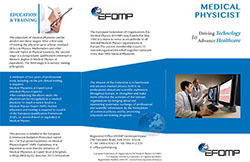 A presentation prepared by Dr Penelope Allisy for the SFPM Congress in Strasbourg in 2012 and a flyer showing Medical Physicists at work has been prepared to illustrate some of the Medical Physics specialty areas. The following paper published in Physica Medica 30(4), 397-402 (2014) traces the historical origins of medical physics in the early seventeenth century. Abstract: The historical origins of medical physics are traced from the first use of weighing as a means of monitoring health by Sanctorius in the early seventeenth century to the emergence of radiology, phototherapy and electrotherapy at the end of the nineteenth century. 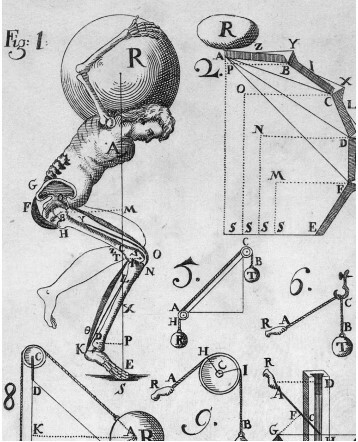 The origins of biomechanics, due to Borelli, and of medical electricity following Musschenbroek's report of the Leyden Jar, are included. Medical physics emerged as a separate academic discipline in France at the time of the Revolution, with Jean Hallé as its first professor. Physiological physics flowered in Germany during the mid-nineteenth century, led by the work of Adolf Fick. The introduction of the term medical physics into English by Neil Arnott failed to accelerate its acceptance in Britain or the USA. Contributions from Newton, Euler, Bernoulli, Nollet, Matteucci, Pelletan, Gavarret, d'Arsonval, Finsen, Röntgen and others are noted. There are many origins of medical physics, stemming from the many intersections between physics and medicine. Overall, the early nineteenth-century definition of medical physics still holds today: ‘Physics applied to the knowledge of the human body, to its preservation and to the cure of its illnesses’. Films produced by the Netherlands Association of Medical Physicists NVKF in May 2018 about the medical physics expert role. The medical physics expert is a medical specialist with in-depth knowledge of physics and medical technology. The medical physicist will make sure that medical equipment and innovations in health care work safely and properly, and ensure that patients will get the best possible treatment. Films produced by the Italian Association of Medical Physicists (AIFM) about the role of Medical Physicists in different disciplines. 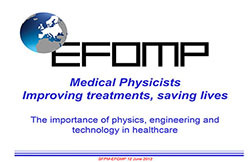 Films produced by the Spanish Association of Medical Physicists (SEFM) on the occasion of the International Day of Medical Physics 2018 trying to respond to frequently asked questions: What is the role of physicists in the hospitals? What is ionizing radiation? Is radiation good? Does radiation produce cancer? What are the X-rays? Is it safe to have an X-ray? What is cancer? How effective is radiation therapy for cancer? What is the procedure for radiation treatment?